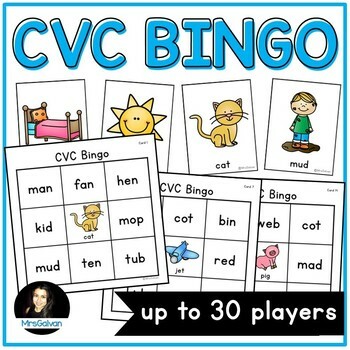 Teacher says the CVC word and shows the picture while children read the words on their bingo card to see if they have the word. Play like Tic-Tac-Toe, 3 in a row is a winner, or play until someone has a full card. 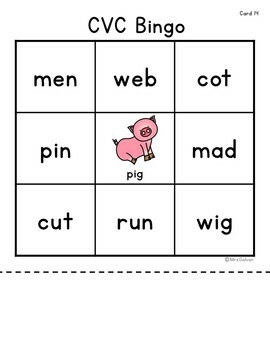 Word Reading is one of the Kindergarten skills tested on the TPRI, Texas Primary Reading Inventory, at the End of Year assessment. 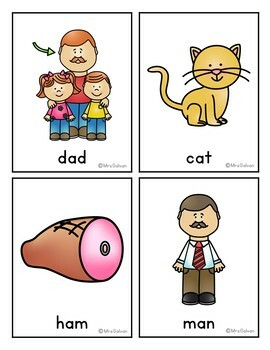 The visuals can also be used as a resource in a writing center to support students writing simple sentences. Print on Astrobrights paper to make it look fun and colorful! Don't forget to leave feedback. 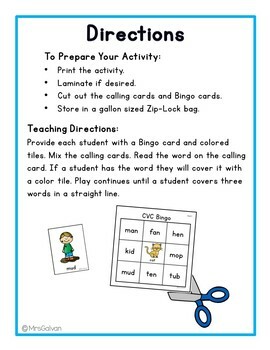 You'll earn credits $$$ for your next TPT purchase. Click here to follow me and you will be notified when new products are uploaded. New products are always 50% off for the first 24 hours. It pays to follow me!